Due to manufacturer's restrictions we are unable to ship Helly Hansen products to Great Britain. Stay warm in this comfortable and stylish Helly Hansen Lifa Merino Seamless Women's Crew. The Merino Wool has a high quality feel to keep you comfortable without sacrificing performance. 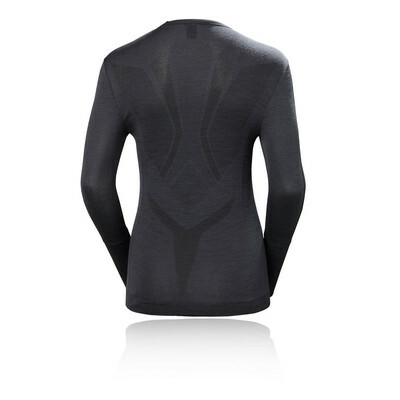 Ideal as a base-layer, this top will deliver in outdoor activities. This top from Helly Hansen is ideal for wearing as a base-layer as it has the feel of a lightweight, fashionable garment but retains the warmth of a typical mid-layer.The two-layer construction helps you to remain focused as you strive for the best results and performance during outdoor activities. Having Merino wool further enhances the comfort without creating too much in the way of bulk so you remain streamlined to deliver a more explosive, accelerated workout. All the meanwhile having seamless construction, therefore there is no chafing and very little bulk, making it even easier to wear under your jacket.Helly Hansen's signature Lifa technology works to actively and efficiently wick away the inevitable build up of sweat and moisture to leave you feeling cool, dry and comfortable. Another feature of the top is that it does not itch, which is ideal when running so you do not become distracted or suffer from discomfort. Furthermore, the top is made with flatlock seams to guard against irritation such as chafing. Helly Hansen's outerwear, base layers, sportswear and footwear are sold in more than 40 countries and are trusted by outdoor professionals and enthusiasts around the world. They move moisture away from the skin, offering protection and performance when you need it most. Seamless Construction - For low bulk and no chafing.